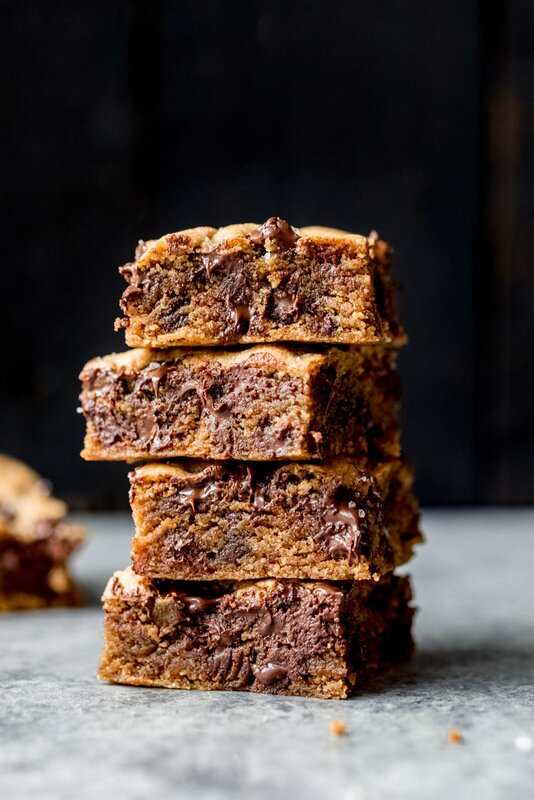 Let me just say that my whole tahini obsession was taken to a new level after I baked these glorious tahini blondies. MY GOODNESS WHERE IS MY TAHINI CROWN. I’m ready to be the tahini queenie. But in all seriousness, these blondies are one of the best things I’ve baked in quite some time. They had been on my test baking list about 3 months. After finally baking them a few weeks ago, I had no idea why I had waited so long because they’re simply INCREDIBLE. Abra and I now refer to them as the sister of my VERY famous tahini brownies. 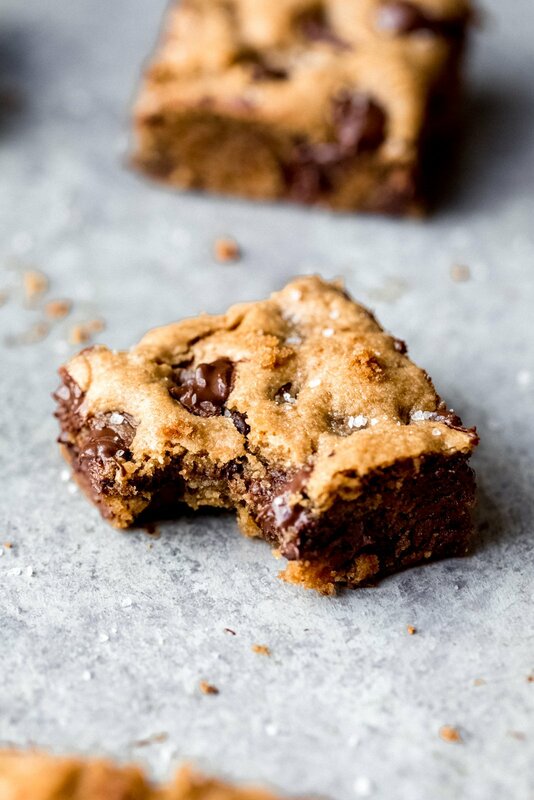 Basically let me just say this: if you’re into chocolate chip cookies AND a fudgy blondie, then you MUST bake these. 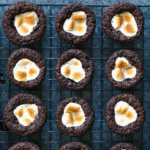 They’re easy and just so happen to be gluten free, grain free, paleo and dairy free. That means that nearly anyone can enjoy these lovely bars. So let’s talk about a few ingredients! Tahini: I mean obviously. The star of the recipe. I LOVE Soom Tahini because of it’s amazing consistency. You can get 10% off your order by using the code ‘ambitiouskitchen’ at checkout! Coconut sugar: I LOVE using coconut sugar in these bars to give them a nice caramel-like flavor. You can pretty much find coconut sugar everywhere these days. I haven’t tried these bars with any other sweeteners, however I’m confident brown sugar would work. You could also try using 3/4 cup pure maple syrup (not a tested version). I would not recommend using honey. Coconut oil: You only need 1/4 cup for the entire recipe and it’s well worth it. It helps gives the bar a gooey consistency. Don’t worry though, you won’t be able to taste any coconut in the recipe. Eggs: Yes, we use eggs in this recipe, but I’m fairly certain it would work lovely with two flax eggs (2 tablespoons flaxseed meal + 6 tablespoons water). Let me know if you give it a try. 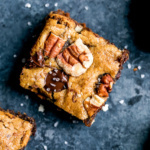 Almond flour: I love using Bob’s Red Mill almond flour in my recipes because… I LOVE BOB and all the products they create. Coconut flour: Incredibly absorbent, low in carbs, slightly sweet and helps to create the perfect consistency for these blondies. Chocolate chips: Chocolate chips were really the way to go with this recipe. You can use dairy free chocolate chips if you’d like to keep this recipe dairy free and/or vegan-friendly. 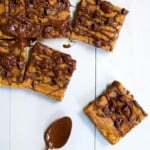 I can’t wait for all of you to make these fabulous bars! They’re delicious served slightly warm and a little gooey… and don’t forget that extra sprinkle of salt on top! SO GOOD. If you make this recipe, be sure to tag #ambitiouskitchen on Instagram. Please also leave a comment and rate the recipe below so I can see how you liked them! Preheat oven to 350 degrees F. Line a 8x8 inch baking pan with parchment paper and spray with nonstick cooking spray to prevent sticking. Set aside. In a large bowl, mix together the eggs, coconut sugar, tahini, coconut oil and vanilla extract until smooth. Next add the dry ingredients: almond flour, coconut flour, baking soda and salt. Mix until a cookie dough consistency forms, then fold in the chocolate chips. Add batter to the prepared pan and spread evenly. Bake for 18-25 minutes until edges are just slightly golden. We want to slightly underbake these so they stay gooey. Once done baking, immediately sprinkle with Maldon salt; remove blondies from pan after 15 minutes. Cut into 16 bars and serve! Delicious with a scoop of vanilla bean ice cream for a blondie sundae. To make these vegan: Use 2 flax eggs instead of regular eggs. 2 tablespoons flaxseed meal + 6 tablespoons cold water mixed in a small bowl. Place in the fridge for 5 minutes to thicken up. Be sure to also use vegan chocolate chips. 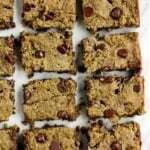 49 Responses to "Paleo Chocolate Chip Tahini Blondies"
I am also tahini obsessed and can’t wait to try these! Do you think AP flour could be subbed for almond flour? Love tahini! I wouldn’t recommend AP flour in here as the consistency will not be the same. 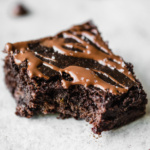 These look good and I’d love to make them for a vegan friend. Only problem is, I’m allergic to coconut. Can I just use olive oil, regular granulated (or brown?) sugar, and more almond flour instead of the coconut products? You can use vegan butter or olive oil. Brown sugar works great. And instead of coconut flour you can use 1/2 cup gluten free flour or regular flour or oat flour and it should work okay. I can’t guarantee because I’ve only tested them this way. Excuse me while I drool over here, ha! They’re SO easy too!! So easy and SO good!! Hey I don’t have tahini, do you think I’d be able to use almond butter or do they have different consistencies? Hi! Almond or cashew butter might work – just be sure that you use one that is all natural and “drippy” because tahini is quite oily. Otherwise the consistency might change a bit when they bake. Tahini is the best in desserts–not so much alone, but I LOVE it with chocolate and fruit! Anyhow, this recipe looks DIVINE and I WANT IT NOW. It’s 10 P.M., so that’s a partially bad sign for me, haha! 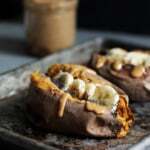 I don’t have tahini and wondering about a sub for tahini in this recipe? Would almond butter work? Almond or cashew butter might work – just be sure that you use one that is all natural and “drippy” because tahini is quite oily. Hi! What is a substitute for almond flour? Allergic to nuts! Can I substitute a different flour for the coconut flour? Sure try packed oat flour! YUM. Do these freeze well? You made my day. Tahini in everything, please! These are amazing! You have me on a tahini kick now. Thanks so much. These were a massive hit!! So gooey and absolutely delicious. No one could believe they were “healthyish”. Amazing as usual!! We’re not fans of the subtle coconut oil flavor so I substituted 1/8 cup avocado oil, 1/8 cup walnut oil. Worked amazing!! The four kids that just devoured them give them a triple thumbs up. Definitely repeating!! Perfect! Great idea with the walnut oil. Glad you guys loved them! It looks awesome, as always ! I have an obsession with tahini and chocolate… Perfect for the afternoon ! Thank you ! 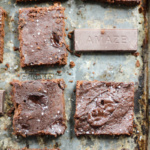 Great Brownies! I came home from work to my 14 yr old daughter baking these in the oven! Will be making again!! These were delicious! I forgot to put the coconut flour in (whoopsie!) but they turned out ok! What would the difference be if I had put it in? Less gooey? Definitely making again! Whoops! Glad you enjoyed them regardless. With the coconut flour they would bake up a bit more and hold together better (less gooey as well). Can I use more almond flour instead of the coconut flour? Thanks – love your recipes! 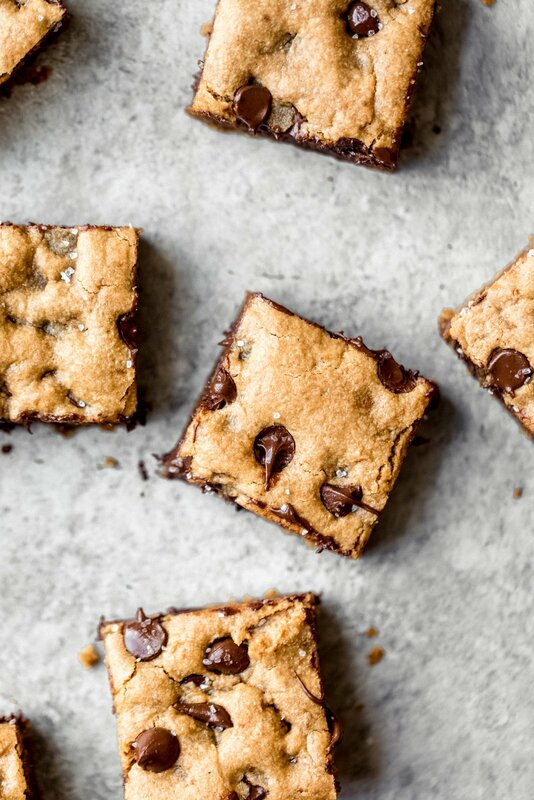 These are the most amazing blondies I have ever made! I use butter flavored coconut oil and it adds so much flavor! Thank you for sharing this recipie!!! You are an incredibly talented lady! These are crazy delicious. My very first paleo/gluten free baking experience. I was not disappointed. One of my favorite desserts ever!! !